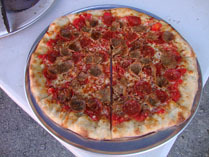 Just when you thought you knew all the places on Put in Bay island to go for a quick bite to eat or to grab a pizza pie, along comes a newbie. We were driving around Saturday morning, minding our own business, when we took the turn at Joe's Bar (corner of Meechem and Catawba) and discovered this collossal pizza oven parked in their lower parking lot! To an uninformed civilian, it might at first glance look like some big kitchen cooking thinga-ma-doo-jiggy with a couple propane tanks hooked up. But to the trained eye, it was a beautiful masterpiece of not-so-modern machinery. Not a chain link in sight and no big-company uniforms. We slammed on the brakes and spun in to the parking lot at Joe's to investigate further. What we discovered was the Sweet Basil Neapolitan Style Pizzeria... on wheels. 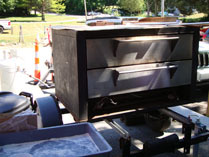 The pizzeria itself is locally owned by Dan Joyce in Cleveland but he also has this great mobile brick-oven pizza maker that he can send wide and far when the call for pizza is heard. He is giving it a whirl up here on Put-in-Bay for the summer, every weekend. So far, according to Joyce, it has been a smashing success. Being outdoors, it is quite visible from the street and the smell of FRESH pizza being baked (yes fresh!) is unmistakable. They make everything right in front of your eyes so you know you are getting the best. A notable exception is that the sauce is prepped ahead of time in their more sanitary kitchen in Cleveland the day before and driven up to the Bay fresh. Fresh is not just a buzzword at Sweet Basil, it is a way of life. You can see the difference in their sauce which has big hunks of tomato in it and is a little runnier than what you would find in a tomato-paste based "big guy" pizza chain. It takes longer to make, but the taste is so much better. Same with the dough, it is made by hand in small batches. The results by and large are so different from anything else on the island that you can't not be pleased. For those with a New York style pizza bent, this pie will feel like home on Putinbay. The crust is thin, flavorful, and has a couple dark burn spots here and there that let you know it was cooked on a hot brick surface and not wheeled through a chain-link conveyor oven. The homemade sausage is cooked in links and then thin sliced by hand and is unlike any other sausage topping we have seen before. 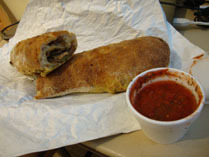 There are pretty much two options on this limited menu... pizza and stromboli (which is essentially a rolled up pizza). Never wanting to let Put-in-Bay readers down, we decided to go for one of each. In the "Boli" department, you are given two options: Pepperoni ($10.00) or Sausage ($11.00). You really can't go wrong with either. It's like asking which you love better, your mother or your father. They are both awesome, one just has a mustache and green peppers (and if you are Italian, that ain't always Dad!). Joyce says, "We roll the strombolis ahead of time back in Cleveland and bring them up here so that we can serve them to you faster. Plus, we don't have these on our Cleveland menu, it is only for Put-in-Bay!" A surprising discovery after our 16-inch stromboli came out golden brown from the oven and sliced in half, was that there was no sauce inside! The red sauce is served on the side, and to good effect. The inside is steamy hot and you can see the layers of cheese and sausage and peppers and dough and cheese and sausage. Soft and chewy and rich on the inside while perfectly crisp and firm on the outside. It looks imposing at 16 inches long and almost 9 inches around (and looks a little bit like Put in Bay Island actually! ), but once you start on it you won't want to stop! The second option is pizza. While only offering 5 varieties of pie (as opposed to over 16 at their main location), the choices are so different from what is offered downtown that you won't really care. Yeah, you can get your plain old cheese pizza, or just a pepperoni, but why not be a bit more adventurous. We did! We saw every one of these pies coming out of the oven during our stay and not one would we have turned down. The Neopolitan ($15.50) smelled of fresh garlic and basil. The Queen Margarite ($16.00) was similar but had big bold chunks of plum tomatoes. The White Pizza ($13.00) wins the prize as the most weirdest because there is no sauce on it, just cheese, cheese, fresh herbs and garlic, and more cheese! But the one that we chose was the Grapes of Wrath Pizza ($16.50). This pie begins life as one of their fresh balls of dough, hand-tossed, and ready for a run through the pizza garden. Once again, this pie interestingly enough does not have "sauce" in the classic sense of the word. It gets a nice layer of shredded mozzarella and grated romano cheese. On top of this are the now common fresh herbs (sweet basil and oregano) and garlic. Layered on top are some little quartered fresh grape tomatoes. And stacked on top are some slices of fresh mozzarella. Finishing out this multi-leveled monster is a generous drizzle of what looks to be a very thick and flavorful balsamic vinegar or balsamic dressing. What comes out of the Put-in-Bay oven after this pie bakes is a transformed creature. All the toppings have molded together and remember how we said it did not have "sauce" per se? The tomatoe chunks, balsamic, and herbs combine and cook together to make a sauce which would make Mama weep in culinary delight. Yum only starts to describe it. They really have their act together here and it shows. From start to finish, everything was fresh and flavorful. The only rating ding is due to a limited menu and that should in no way stop you from trying this pizza heaven on wheels. If you are already at Joe's Bar, step outside and order a whole pie which should feed 2 easily. If you are just driving around and swing in, grab a slice ($3.25) to go. Food trucks are making bigger and bigger headlines across the country from New York City with their falafels, gourmet ice cream, and dumpling trucks to Columbus Ohio's infamous westside string of taco trucks (try the "taco al lengua" if you ever are down there) and it is nice to see we have one now here at Put-in-Bay Ohio on the weekends. You can reach Sweet Basil Pizzeria by calling 440.899.1899. You also can follow them online at http://www.sweetbasilpizza.com/ or e-mail them at dan@sweetbasilpizza.com .